The New Zealand green-lipped mussel (lat. Perna canaliculus), which is also known as the New Zealand mussel or the greenshell mussel, kuku, and kutai, is a bivalve mollusc of the family Mytilidae (the true mussels). It has economic importance as a cultivated species in New Zealand. It is native to the New Zealand coast and is an essential diet of the indigenous Maori culture typically in those who live in coastal regions. Interest in the health benefits of this mussel came from the observation that coastal Maoris people had a lower incidence of arthritis than their European or inland Maori cohorts. In that manner, the anti-inflammatory effects of green-lipped mussel have been extensively studied. Green-lipped mussel products have been suggested as adjunct therapies for a number of inflammatory conditions including asthma, osteoarthritis, and rheumatoid arthritis. However, there is limited evidence for its clinical benefits for treating asthma, but the preliminary results are encouraging. Its most popular use is in relieving joint pain and inflammatory joint disorders. While there is some evidence supporting the use of green-lipped mussel in treating osteoarthritis, the overall evidence for rheumatoid arthritis suggests inefficacy. Is green lipped mussel safe? What are popular brand names for New Zealand Green-Lipped Mussel products on the market? As a food or as a dietary supplement, New Zealand green-lipped mussel is not regulated by the FDA. It is also not listed in the FDA GRAS (Generally Recognized as Safe) list as a food additive. But, the anti-inflammatory effects of green-lipped mussel have been studied extensively. Green-lipped mussel products have been proposed as adjunct therapies to a number of standard treatments for chronic inflammatory conditions. Rigorous clinical trials that examine the purported 5-lipoxygenase (5-LOX) inhibitory activity of Lyprinol green-lipped mussel extract as well as its purported ability to inhibit cyclooxygenase (COX) enzyme activity are warranted. Most of the anti-inflammatory activity of green-lipped mussel is believed to be in the lipid fraction. According to industry, the original freeze-dried powder preparations are up to 125 times less potent than stabilized lipid extracts (such as Lyprinol R ), and many currently available powders have little or no anti-inflammatory activity. The delipidated byproducts of the extraction process, which also have very little (if any) anti-inflammatory activity, have also been packaged and sold in low-cost green-lipped mussel products. Recommended doses are based on those most commonly used in available trials or on historical practice. But, with natural products it often is not clear what the optimal doses are to balance efficacy and safety. Preparation of products may vary from manufacturer to manufacturer, and from batch to batch within one manufacturer. Because it often is not clear what the active component(s) of a product is, standardization may not be possible, and the clinical effects of different brands may not be comparable. There is no well-known standardization for green-lipped mussel. New Zealand Green-lipped mussels provide omega-3 fatty acids, and each capsule of Lyprinol is standardized to contain 50 mg omega-3 fatty acids and 100 mg olive oil. Asthma: Two capsules of Lyprinol (containing 50 mg of omega3 polyunsaturated fatty acids and 100 mg olive oil per capsule) has been used twice daily for eight weeks for steroid-naive atopic asthma. Osteoarthritis: Green-lipped mussel has been used in the following doses to treat osteoarthritis: 1,050 mg mussel extract (three capsules) daily for 3–6 months, six capsules Seatone daily (no details given) for six months, 210 mg Lyprinol (or 1,150 mg mussel powder) daily for 3–6 months or four capsules Lyprinol daily (dose not specified) for two months followed by four months of two capsules daily. Rheumatoid arthritis: Mussel extract capsules have been used daily for 90 days. A 210 mg Lyprinol has been used daily for three to six months. For inflammatory rheumatoid arthritis, an unclear dose of Sanhelios Mussel Lyprinol Lipid Complex has been used for 12 weeks. 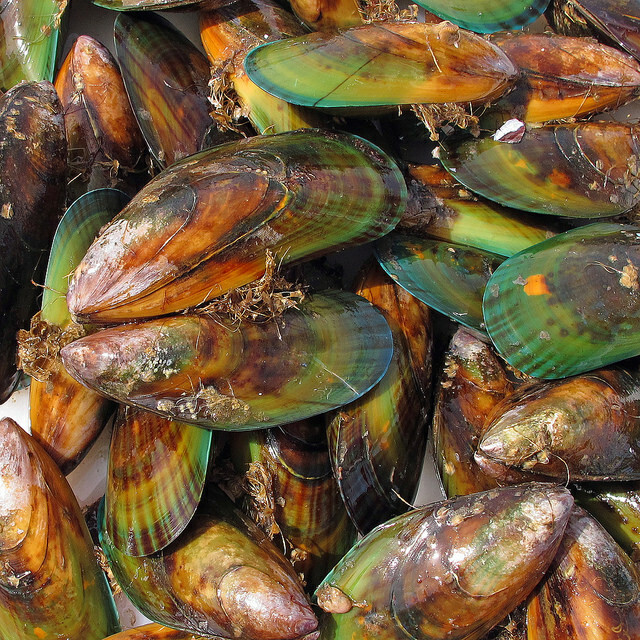 There is no data about New Zealand Green-Lipped Mussel dosing in children. Green-lipped mussel contains about 61% protein, 13% carbohydrates, 12% glycosaminoglycans (GAGs), 5% lipids (including eicosatetraenoic acids, or ETAs), 5% minerals, and 4% water. The protein fraction of green-lipped mussel hemolymph consists mainly of pernin, a glycosylated protein with serine protease inhibitor activity. According to industry, green-lipped mussel contains betain, glycosaminoglycans (including chondroitin sulphate and heparin), and 18 amino acids; these nutritional elements are retained in Lyprinol lipid extracts after processing. Lipid extracts of green-lipped mussel contain mostly sterol esters (cholesterol and desmosterol/brassicasterol), triglycerides, free fatty acids, sterols, and phospholipids. Like many other bivalves, green-lipped mussels contain toxins; the B4 analog of brevetoxin B (BTXB4), has been identified as the major toxin in green-lipped mussels, and has been associated with neurotoxic shellfish poisoning. Green-lipped mussel may also contain yessotoxins (YTXs), pectenotoxins (PTXs), and low levels of okadaic acid (OA). Anti-inflammatory effects: Natural antioxidants (such as carotenoids) of this mussel are suggested to have anti-inflammatory effects. 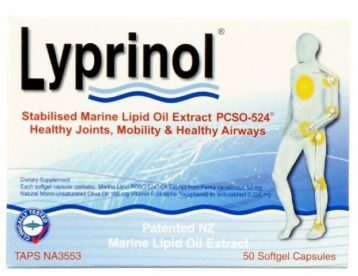 Analysis showed that Lyprinol is suggested to contain more bioactive lipids than other plane or marine oils. The anti-inflammatory effects of New Zealand green-lipped mussel have previously been attributed to a proteinaceous macromolecule or a polysaccharide/protein (glycogen) component. However, the lipid fraction is currently believed to have the most therapeutic potential. The anti-inflammatory activity of green-lipped mussel extract is said to differ in potency depending on the preparation stability. However, Lyprinol is prepared using a supercritical fluid extraction (SFE) process of the stabilized freeze-dried mussel powder; the resulting extract represents about 5% w/v of freeze-dried mussel powder and purportedly demonstrates superior stability and potency. Extracts of green-lipped mussel proved to moderately inhibit purified COX-1 and COX-2 enzymes in vitro, in vivo, and in clinical settings. Lyprinol demonstrated strong inhibition of COX enzymes in vitro. Its polyunsaturated fatty acids act as competitive inhibitors of arachidonic acid (AA) metabolism. A bioactive compound of green-lipped mussel has shown inhibition of lipoxygenase products of the AA pathway. Green-lipped mussel extract has been demonstrated to affect the 5-lipoxygenase pathway on several levels and has been suggested to modulate the 12–1ipoxygenase pathway. Lyprinol metabolites have also been shown to inhibit leukotriene B4 (LTB4) biosynthesis by polymorphonuclear cells and human monocytes. It also may inhibit cytokine production by activated macrophages. Lyprinol has also been suggested to act as a leukotriene receptor antagonist, which may contribute to uterotrophic effects. Some studies indicate that Lyprinol may mimic the anti-inflammatory effects of corticosteroids (e.g. as prednisone). It has been used in combination with pentoxifylline (to treat chronic inflammation in rodents. The anti-inflammatory effects of Lyprinol have been shown to benefit experimentally induced inflammatory bowel disease (IBD) and intestinal mucositis. Antihistamine effects: Green-lipped mussel is claimed to have antihistamine effects, however, one study on Lyprino showed little or no activity against histamine. An active ingredient with antihistamine activity has been isolated from green-lipped mussel but has not been thoroughly characterized. Endocrine effects: Similar to NSAIDs (such as aspirin, indomethacin, and naproxen, which may interfere with ovulation and prolong the gestation period), green-lipped mussel extract may contain pharmacologically active material inhibiting prostaglandin biosynthesis. Immunomodulating effects: In vitro studies showed that green-lipped mussel extracts may reduce cytokine production and neutrophil superoxide burst, which may benefit inflammatory diseases with a proinflammatory cytokine component. Extracts prepared with detergent (Tween-20) and hydrochloric acid (HCl) also demonstrated anticytokine activity and inhibition of immunoglobulin G production. Lyprinol has been demonstrated to suppress the hyperactivation of monocytes in allergic patients, which has been suggested to contribute to its antiallergy effects. Ocular effects: Docosahexaenoic acid (DHA), the main marine omega3 fatty acid, is prevalent in green-lipped mussel; DHA is localized in the retina and may play a role in retinal function. Uterotrophic effects: Lyprinol has been suggested to act as a leukotriene receptor antagonist, which may contribute to uterotrophic effects. Is New Zealand Green-Lipped Mussel toxic? Green-lipped mussel seems to be generally well tolerated, and data suggest that heavy metal contamination is usually not a concern, unlike oysters. However, Green-lipped mussels ingredient – B4 analog of brevetoxin B (BTXB4), has been identified as the major toxin in green-lipped mussels and has been related to neurotoxic shellfish poisoning. Complete toxin profiles of green-lipped mussel may also include yessotoxins (YTXs), pectenotoxins (PTXs), and low levels of okadaic acid (OA) Possible toxic hepatitis has been associated with Seatone in several case reports. Can Green-lipped mussel products cause allergy? There are described allergy or hypersensitivity reactions to green-lipped mussel or other shellfish such as mollusks and crustaceans. Studies showed that freeze-dried preparations of green-lipped mussel contain more proteinaceous allergens than lipid preparations. Allergic reactions to gelatin that are used in capsule preparations have also been noted. chest tightness, and difficulty breathing. Allergic or some predisposed and sensitive individuals may experience difficulty breathing after ingesting or inhaling green-lipped mussel products. Lung dysfunction and multiple respiratory symptoms have been reported in New Zealand mussel openers. Cardiovascular: Fluid retention has been reported as an adverse effect of green-lipped mussel use. There is also a case report from a clinical study where one patient in the Lyprinol treatment group suffered heart failure. The relevance of this to the treatment is unclear. Dermatologic: According to the The Australian Rheumatism Association, skin rash is listed as a possible adverse effect of using Seatone green-lipped mussel extract . Itching, hives and metal taste have also been reported. Gastrointestinal: Stomach upset, flatulence and mild nausea are possible adverse effecst of using Seatone greenlipped mussel extract. Musculoskeletal: Gout may be a possible adverse effect of using Seatone green-lipped mussel extract. Of rheumatoid arthritis patients taking Seatone for 90 days, 10% reported a transient worsening of symptoms, although no other adverse events were experienced. Neurologic/CNS: Green-lipped mussel’s B4 analog of brevetoxin B (BTXB4), has been identified as the major toxin in green-lipped mussel, and has been associated with neurotoxic shellfish poisoning. Other side effects: Polioviruses have been found to survive in green-lipped mussels, both in fresh mussels and in those frozen for up to 28 days at 20 degrees Celsius which may constitute a significant public health risk. Use cautiously in patients taking anti-inflammatory medications. It has been suggested that green-lipped mussel may enhance not only the benefits of other anti-inflammatory drugs, but also their adverse effects (particularly gastrointestinal upset). Avoid in patients with known allergy/hypersensitivity to green-lipped mussel or other shellfish (mollusks, crustaceans). Powdered greenlipped mussel is reported to be more allergenic than lipid extracts; allergic reactions to gelatin (used in capsule preparations) have also been noted.